$429.99/day. This Human Whack a Mole is up to a 7 Player Game that is a ton of fun. One player enters the center of the game as the whacker with an inflatable hammer. The next 6 participants put on helmets and find an open mole hole. Plastic balls are placed in the circle around the whacker. The object to the game is for the moles to pop up and take as many balls as they can before being whacked on the head. The balls are placed in a storage bag attached to the side of the inflatable. 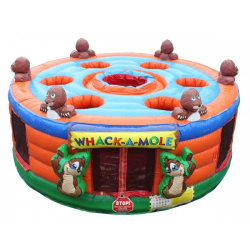 The mole with the most balls at the end of the game is the winner and moves to the whacker position!